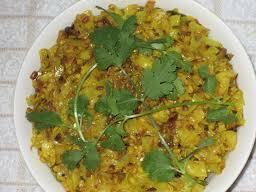 1) Wash the dal in fresh water and soak it for 5 to 10 min. 2)cut cabbage into small pieces (check for insects ) and wash it . 6) Saute them for 2 min on very low flame. 7) Now add cabbage, red chili powder, coriander powder after 2 min add soaked dal. 8) Cover it with a lid and cook finely. 9) Add masala and coriander leaves .